Free version of Traffic Pro © EA with a limit 0.01 per order. Traffic Pro © is a Ready-to-Grow multifunctional 100% automatic trading system with double protection of account funds: stop loss for each order / DDStop system. Traffic Pro © shows consistently high results in several modes of operation: scalper / grid / grid scalper. Flexible settings allow you to use Traffic Pro © for both short-term and long-term trading. Autolot-system for calculating the start order depending on the account balance. AutoLot - the lot size of the first order multiply increases, based on the ratio of the size of the account funds and AutoLotSize. This is a nice EA! Thanks author offer as free! Key thing is always stick to the developer recommendation. Сегодня Алексей помог запустить самый последний вариант. Пока все хорошо, потом напишу подробнее. It works pretty good. Thank you, Aleksei. EA works really well and Aleksei is very helpful. Both the backtest and the real are good. Попробовал на ценовом счёте - реально работает, но конечно 0.01 для стартового лота маловато) Буду думать про версию Pro. 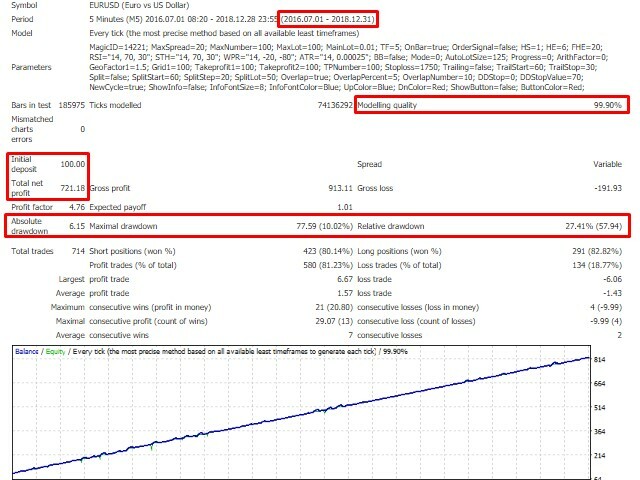 Takeprofit2 (points) - take profit level for the orders starting from TPNumber. TPNumber - the number of the order, starting from which the take profit value changes.